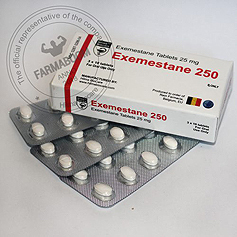 EXEMESTANE 250 (AROMASIN) is an aromatase inhibitor class medication used in bodybuilding to suppress the estrogenic side effects of steroids. He is also known by the name of aromazin, which was patented by Upjohn, who created it. For the first time an anti-estrogen appeared on the American market at the very beginning of the two thousandth, immediately after receiving permission to sell. Like other representatives of this class of anti-estrogens, exemestane is widely used in medicine for the treatment of breast cancer diseases in women during menopause. However, the drug received no less popularity in sports, as it is able to effectively suppress the estrogenic side effects of AAS. Its mechanism of work resembles the more popular aromatase inhibitors – letrozole and anastrozole. However, unlike them, athletes often use exemestane in bodybuilding after a course of steroids. As mentioned above, exemestane is able to effectively block the aromatase enzyme, which is responsible for the conversion of testosterone into female hormones. As a result, the concentration of estrogen in the blood decreases. Due to this, the drug is effective in combating cancer of the breast, as their development is directly related to the growth of estrogen levels. The same fact made exemestane popular among athletes who actively use steroids. Many AAS have the ability to aromatize, and this leads to the development of certain side effects, for example, the delay in the body of a large amount of fluid and gynecomastia. The most serious negative effect among them is considered to be the second. However, with active fluid retention can significantly increase blood pressure. It should also be remembered that non-aromatic AAS can also cause estrogenic side effects if they are characterized by progestogen activity. A striking example of such steroids are nandrolone esters. This drug interacts weakly with aromatase (not more than 20 percent of testosterone), but it also has high progestogenic properties. Numerous studies have shown that an increase in progesterone levels leads to the development of gynecomastia. Using exemestane in bodybuilding on the course of steroids, the athlete will be able to eliminate the risks of developing estrogenic side effects. According to research, aromazine can reduce the level of estradiol in the blood by 85 percent of the initial indicator. This is not the only positive property of the drug that has made it popular among builders. The fact is that taking exemestane in bodybuilding after a course of steroids can speed up the process of secretion of endogenous male hormone. Some athletes do this, including this aromatase inhibitor in PKT. It should be recognized that letrozole with anastrozole also has a similar effect. They can send to the pituitary a signal about the need to start the production of hormones of the gonadotropic group – luteinizing and follicle-stimulating. It has a low androgenic activity. Accelerates the secretion of insulin-like growth factor. No other representative of the class of aromatase inhibitors has such properties. Using exemestane in bodybuilding after a course of steroids, an athlete can not only quickly restore the processes of testosterone synthesis, but by increasing the concentration of insulin-like growth factor shifts the balance between anabolism and catabolism towards the first. Some builders are confident that this has a positive effect on the restoration of the body, because the effect of rollback is minimized and the muscle tissues are protected from destruction. However, if you deal with the direct results of using exemestane in bodybuilding after a course of steroids, it becomes clear that this is undesirable. An excellent means of preventing gynecomastia. Effectively suppresses the level of female hormones. Promotes the growth of anabolic background. Improves the relief of muscles. It is a good means of preventing hypertension. Reduces the negative impact of estrogen on the pituitary arc. When using the drug for medical purposes, it deprives the cancer cells of the “estrogen” necessary for their vital activity. The effectiveness of the use of aromazine for these purposes is beyond doubt. However, it is recommended to use tamoxifen first. If this drug did not give positive results, you should start using exemestane. However, even with high efficacy, this drug is used less frequently in medicine than anastrozole. This is due to the fact that arimidex in many matters behaves similarly to the primary aromatase inhibitor. And this happens not only in the treatment of breast cancer after menopause, but also during the treatment of other oncological ailments. However, we are more interested in the mechanisms of exemestane applied to suppress the negative effects of anabolic steroids. Acquainted with the properties and effects of the drug, it is already possible to draw certain conclusions in this matter. It is important to remember that when using steroids, the side effects of the estrogen type may not appear. If we talk specifically about the estrogenic sideways, then for their development the AAS athlete used must have the ability to aromatize or progestogenic activity. The primary flavoring anabolic is testosterone. However, drugs based on derivatives of this hormone substances can enhance the work of estrogen. A vivid example here can be metandienone. Also to such steroids can be attributed to boldenone, whose ability to flavoring is 50 percent of the dough. This is not enough for the rapid increase in the concentration of female hormones. Among the steroids that can cause estrogenic side effects are still trenbolone and nandrolone. They weakly aromatize, but at the same time have a strong progestogenic activity. This may be enough for the level of female hormones to exceed normal limits. This largely depends on the genetic characteristics of the organism. Trenbolone is not able to interact with the aromatase enzyme, however, due to the high progestogenic activity, the development of gynecomastia is possible. This happens again, with the genetic predisposition of the athlete. If these drugs are used in conjunction with flavored AAS, the risks of side effects of the estrogen type increase. Regardless of the anabolic used, exemestane can protect you from side effects. Steroids are widely used in sports, which are based on substances derived from dihydrotestosterone. They are in principle not able to aromatize. An exception to this rule is oxymetholone, which is characterized by estrogenic activity. However, he is not able to aromatize and on the course of anapolone aromazin will not be effective. Now consider the mechanisms of the aromatase inhibitor, which occur when using exemestane in bodybuilding after a course of steroids. You should know that on an anabolic course, the process of synthesis of an endogenous male hormone is suppressed. The degree of this negative effect of AAS depends on the steroids used and their dosages. However, even the lightest drug can negatively affect the work of the pituitary axis. After the completion of the anabolic cycle, the body begins to synthesize testosterone again, but only after all exogenous hormones are utilized. This will require a large time period. Much depends on the characteristics of the body of an athlete, and in the worst case can take about a year. It is quite obvious that such a situation is unacceptable. PCT is carried out specifically to accelerate the secretion of endogenous male hormone. In itself, the state of low dough is abnormal, but additional negative points appear. In particular, increases the level of cortisol, which destroys the muscles, and also decreases sexual desire. We have already noted that aromazin is able to accelerate the processes of testosterone synthesis. In this case, the drug is characterized by low androgenic activity, and it accelerates the secretion of insulin-like growth factor. All this leads to the fact that some athletes begin to use exemestane in bodybuilding after a course of steroids. However, they forget about the main purpose of this drug – inhibition of the enzyme aromatase. There is no doubt that the high concentration of estrogen leads to undesirable consequences for men. But the balance between female and male hormones is also crucial. Scientists have proven that estradiol regulates the balance of lipoprotein compounds, normalizes the work of the body’s defense mechanisms and affects the libido. The main task of rehabilitation therapy after anabolic cycles is the stimulation of testosterone secretion processes. But it is important to remember about the normalization of all body systems. Exemestane can be part of your cycle. (Exemestane during steroid cycle prevents the side effects that steroids can cause – flavoring). Also Exemestane can be used as Post Cycle Therapy. Recommended dosages of the drug are in the range of 12.5 to 25 milligrams, and it is necessary to use it every second day. However, in most cases it is enough for athletes to use exemestane in an amount of 12.5 milligrams not more than three times a week. If the maximum permitted dose is used, the duration of such a course of exemestane should not be long. Use 25 milligrams is only in violation of the balance of cholesterol, and in other situations, to limit the minimum dosage. Also in professional sports, exemestane is sometimes used one or two weeks before the start of a tournament, which helps improve muscle relief. You can buy EXEMESTANE 250 (AROMASIN) from the brand HILMA BIOCARE in our online store.